A research team composed of Dr. CHENG Zhengwei, Prof. SHI Jiankui, Prof. Dunlop M and Prof. LIU Zhenxing from the State Key Laboratory of Space Weather, the National Space Science Center (NSSC) recently breaks the deadlock and revealed the influence of the Interplanetary Magnetic Field (IMF) By component on the flow direction and the density of Field-aligned Currents (FACs) in the Plasma Sheet Boundary Layer (PSBL) in the magnetotail during the northward IMF. The interaction of the solar wind and Earth's magnetosphere is a frontier topic in the study of space physics. And the solar wind/IMF can exert important effect on controlling the disturbance in the magnetosphere. Previous studies have shown that the influence of IMF By exists not only in the near-Earth region where field lines are closed, but also in the near-Earth magnetotail and the distant magnetotail. 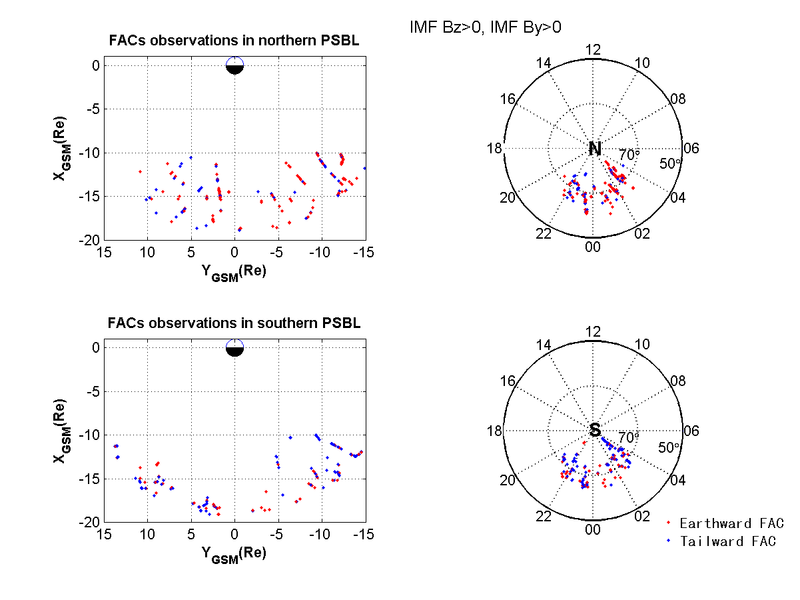 However, little attention has been paid to the effect of IMF By on the FACs at plasma sheet boundary layer (PSBL) in the magnetotail during northward IMF, which results in the limited understanding on the solar wind-magnetosphere interaction during northward IMF conditions. In this study, by statistically analyzing 748 FAC cases form July to October in 2001 and 2004 during northward IMF, for the first time, the research group revealed the influence of the IMF By on the FACs in the PSBL in the magnetotail during the northward IMF. The results show that IMF By component plays a very important role in controlling the flow direction of the FAC. In the northern hemisphere, the influence of the positive (negative) IMF By is an earthward (tailward) FACs. To the contrary, in the southern hemisphere, the effect of the positive (negative) IMF By is a tailward (earthward) FACs. 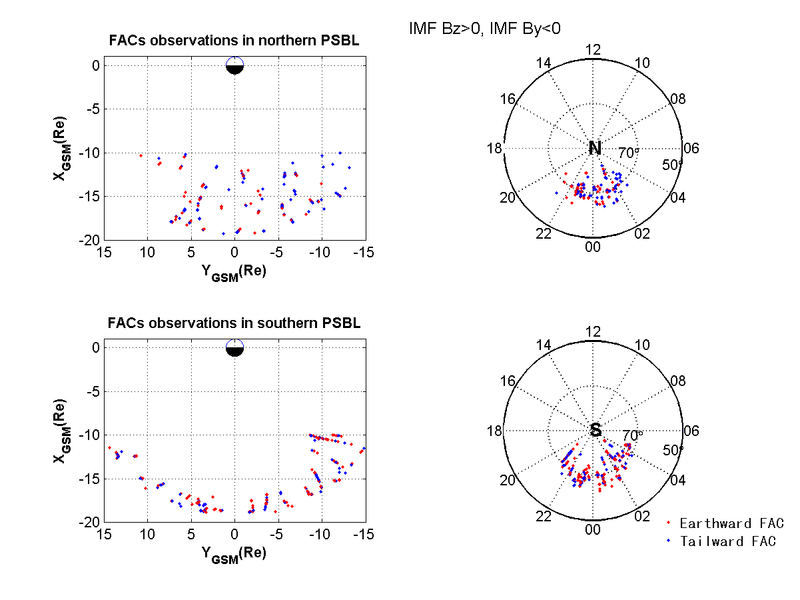 There is a clear north-south asymmetry of the polarity of the FACs in the PSBL when IMF By is positive or negative, and this asymmetry of the polarity is more distinct when IMF By is positive. The research group therefore interprets that such asymmetry is caused by the asymmetry of the configuration of the magnetosphere, the conductivity in the ionosphere, and the various solar wind-magnetosphere interaction processes. The results also show that when |IMF By| is more than 10 nT, the absolute FAC density in the PSBL has an obvious positive correlation with the |IMF By|. Whereas when |IMF By| is less than10 nT, there is no solid correlation between the absolute FAC density and |IMF By|. This could be caused by the process that the IMF By sinks into the mageototail, the strong IMF By becomes easier to sinks into PSBL, which explains the good correlation between strong IMF By and FAC density. According to the lead author of the article entitled IMF By-controlled field-aligned currents in the magnetotail during northward interplanetary magnetic field , this work will facilitate a better understanding on the solar wind-magnetosphere coupling and the physical process of the solar wind energy transport during northward IMF. And it will also help space physicists to know the causal chain of space weather and builds its physical model. The work was published in August on the Journal of Atmosphere and Solar Terrestrial Physic (JASTP).